Anyone who has lived in Delhi long enough has some sort of attachment to Olive Qutub/Mehrauli. All white walls and pebbles create a reminiscence of the Mediterranean, entwined with sprawling banyans and foliage makes it almost ethereal - no wonder it is often voted as the most romantic restaurant in Delhi. But lets face it it has been a while since the food beckoned your presence. Ambience could no longer compensate for the lacklustre food. Even their once famed pizzas, the safe zone, had been breached. Just when I had given up all hope, in walked Chef Sujan Sarkar. Bubbling, stirring, toiling like that kitchen hasn't seen in a long time. And that, my crumpets is how Olive got its groove back. 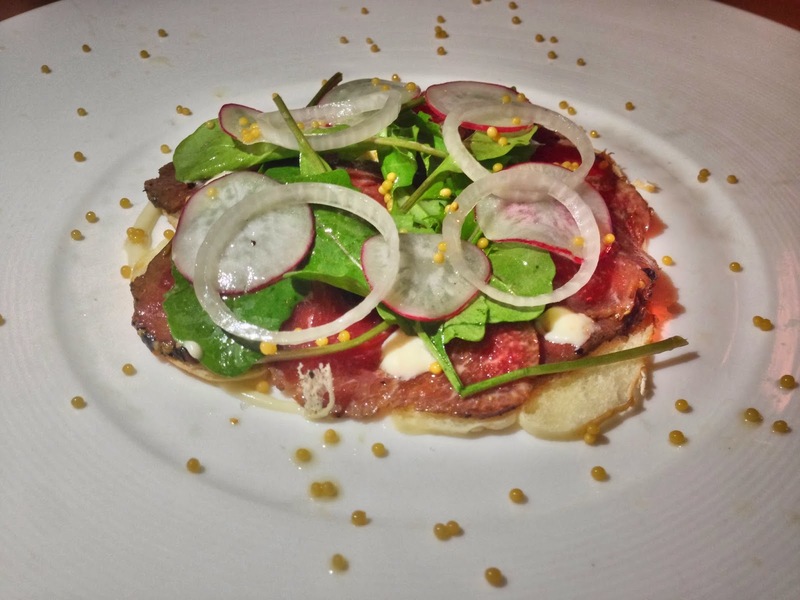 Spice Rubbed Tenderloin Carpaccio w/ Horseradish Cream, Pickled Mustard, Rocket, Baby Radish. Yummy! A melange of subtle flavours and bolder textures. Loved the melba toast sneakily tucked under it all - every bite was complete. 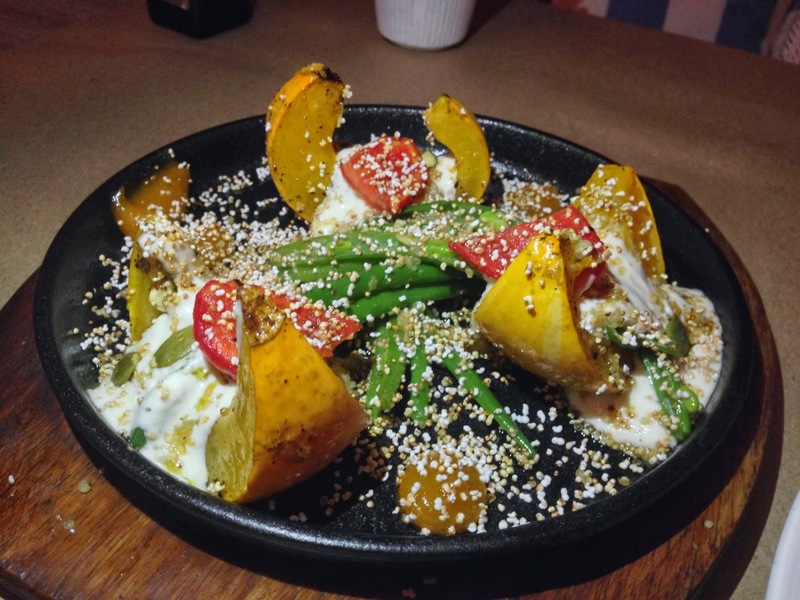 Roasted Pumpkin Green Beans Salad w/ Mascarpone Lebneh, Quinoa, Popped Amaranth, Pumpkin Seeds, Apricot Purée - This is one of my favourite dishes from the new menu. You really must try it. So many flavours, yet so well balanced. It's sweet, creamy, salt, with a bunch of different textures. Wholesome in the best of ways. I'm craving it again already. Foie gras, confit chicken and duck leg terrine w/ Apple purée, poached pear, toast brioche. The layer of foie gras was nice, the other two were ok not bad. Not a must order, but if youre a bunch of people and want some extra nibbles, then pile it on. Only down side to this was the brioche - something almost mithai like in its flavour. I always prefer something not as fluffy and soft with my pate, perhaps it could have been toasted a bit more. 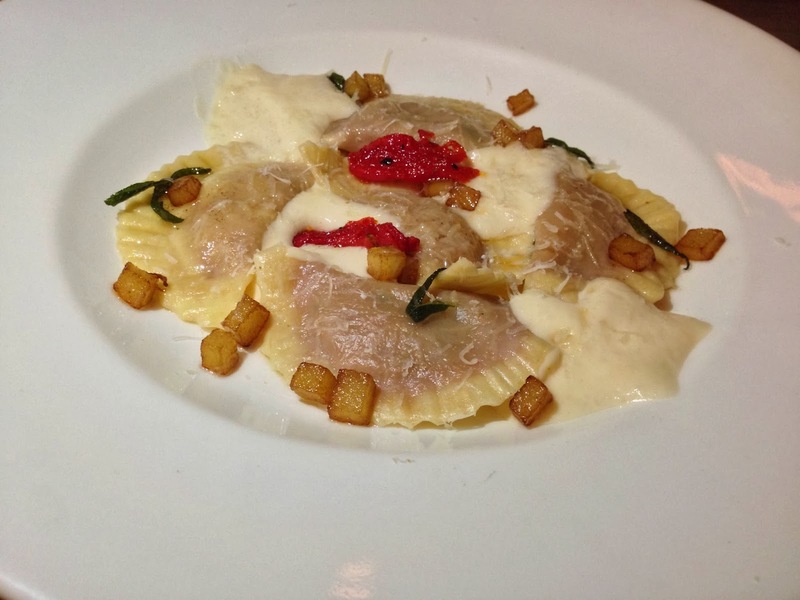 Mezzaluna Pasta w/ Crumbled Sausage & Green Apple - Perfect little half moon delights, packed generously with meaty goodness. Loved the sautéed apples. I would have preferred the sage butter sauce to be slightly less thick. But, they used it sparingly enough that it didn't get too heavy. 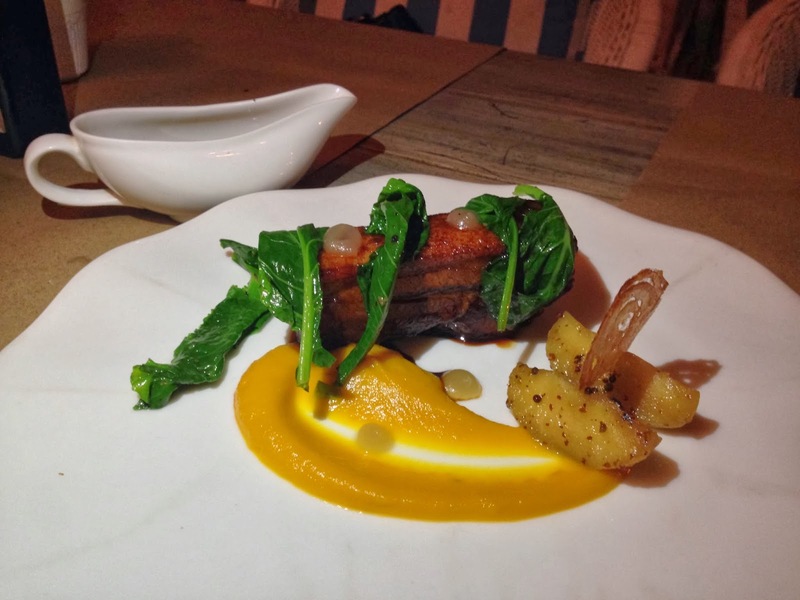 Slow Cooked Pork Belly w/ Carrot Purée, Mustard Glazed Apple, Crackling - Delicious! Tender, flavourful meat, served with the perfect side kick, mustard glazed apple. My only complaint was the crackling, and I do love my crackling. I would have forgiven the portion if they got the texture right - this was too tough, leathery and a bit stale. I would have preferred a slightly thicker, crunchier serving. Truffle Mash - Ordered a side of this. Only really disappointing thing. Well the mash was super - but those truffles may as well have been shavings of plastic. First bite - taste nothing. First sniff - smell nothing. I take out a shaving of the truffle and eat it on its own - still nothing. So Im guessing they must be either really stale or really poor quality - because I have never eaten anything with truffle that doesn't have a powerful aroma and flavour. 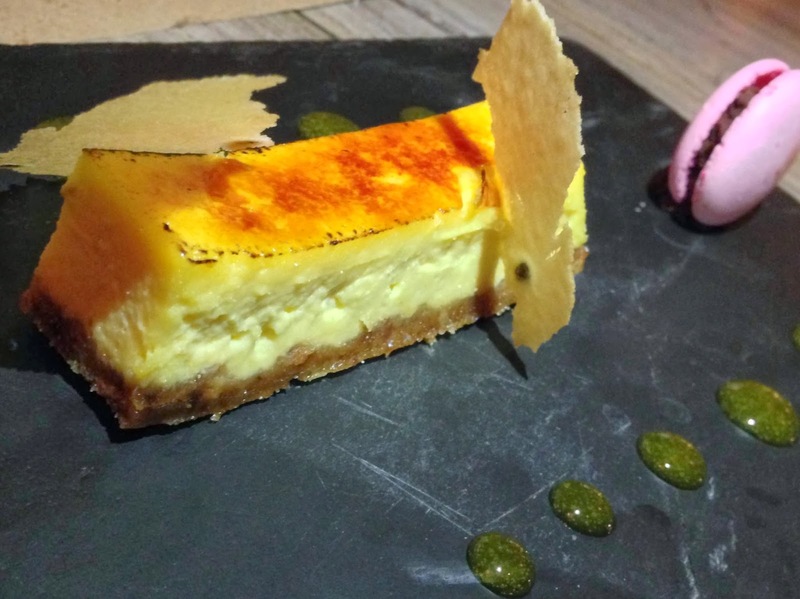 Caramelized lemon tart w/ Lemon sable, passion fruit tuile, raspberry macaron - More like a lemon cheesecake than a lemon tart (caramelised or not) but I liked it anyway. However, the macaron was mediocre at best. I did try a couple more desserts last time too - both were average - the pear tarte tatin and the milli feuille of strawberries (think it had those not-so-great macarons in it - seems to be popular) . But I love tarte tatin so I am going to give that another shot next time.